Go anywhere in Japan, and one thing becomes clear. The Japanese LOVE crab. 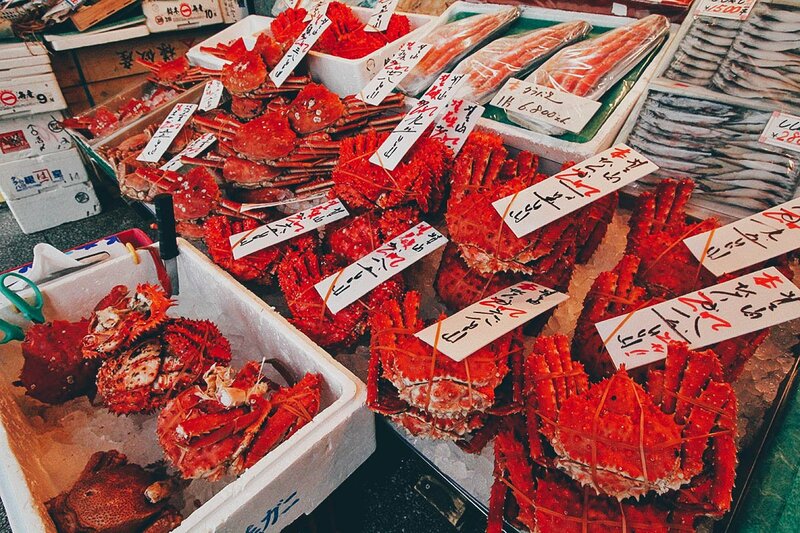 Japan’s love for crab is legendary, its crab consumption being one of the highest in the world. 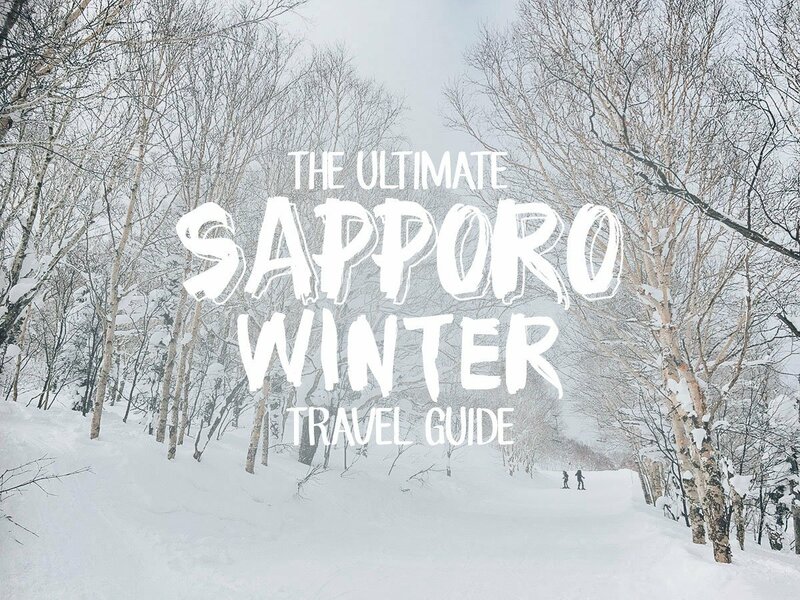 Typically eaten in the colder months, it’s the quintessential winter dish in Japan and there’s no better place to have it than here in Hokkaido. 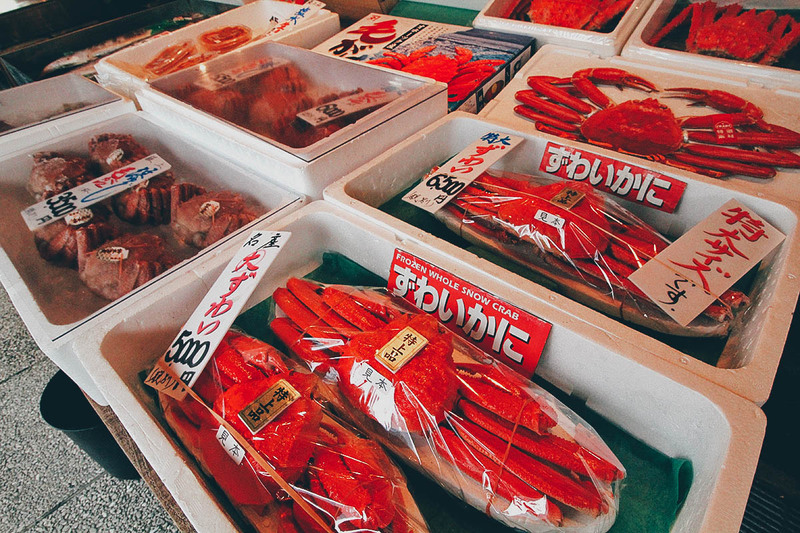 We were in Sapporo to attend the Sapporo Snow Festival so we made a quick stop at Nijo Market – a Disneyland for seafood lovers and one of the worst places in the world to be a crab. No matter where you turn your head its snow crabs, king crabs, hairy crabs, thorny crabs…it’s like a bouquet of crustaceans everywhere you look! 😯 Nijo Market is a short walk from the Sapporo TV Tower so you can make a quick stop here after visiting the Odori site of the festival. The crabs to the left are called hairy or horsehair crabs while the ones to the right are king crabs. 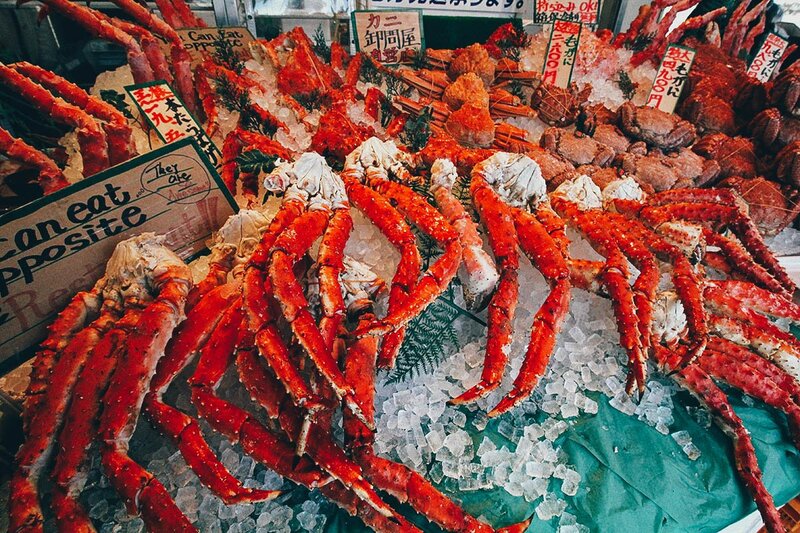 King crabs are the biggest and have tons of meat in their legs. Hairy crabs are the opposite. 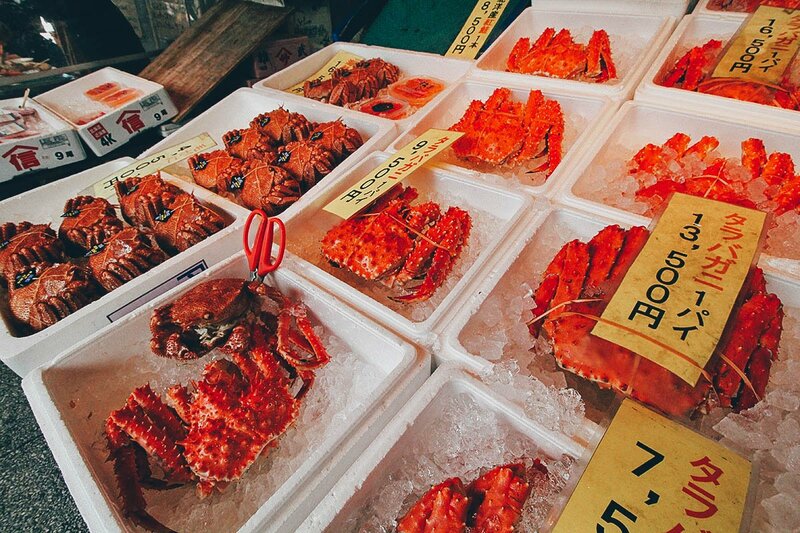 They don’t have much meat but are oozing with rich crab roe. Crabs are expensive everywhere, including here in Hokkaido, so we opted to try just the king and snow crabs at Kani Syougun restaurant. 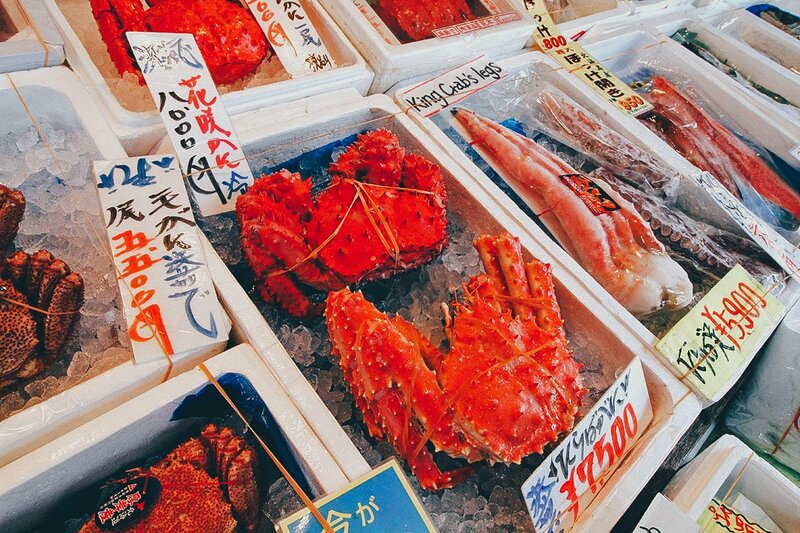 That big king crab on the right is priced at JPY 13,500 which at today’s exchange rate is roughly USD 112. Not cheap! The crabs wrapped in plastic are snow crabs. 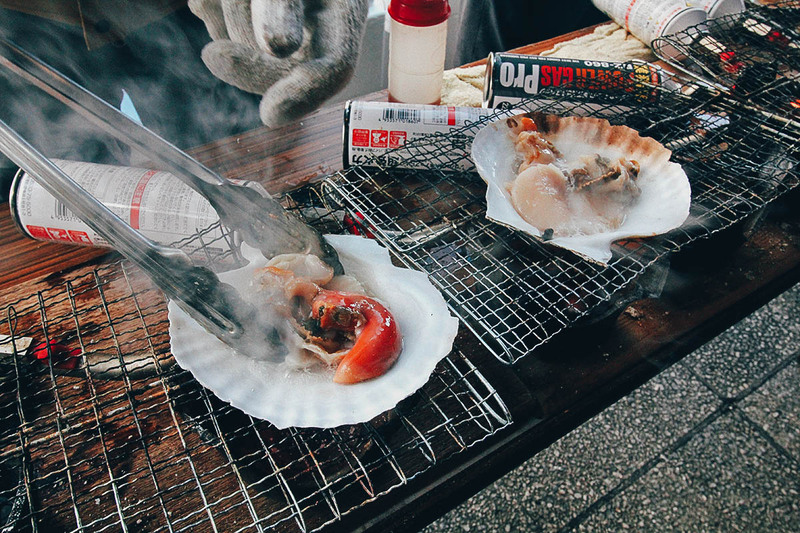 If you’re ever in Hyogo prefecture, then you may want to try Matsuba crabs. 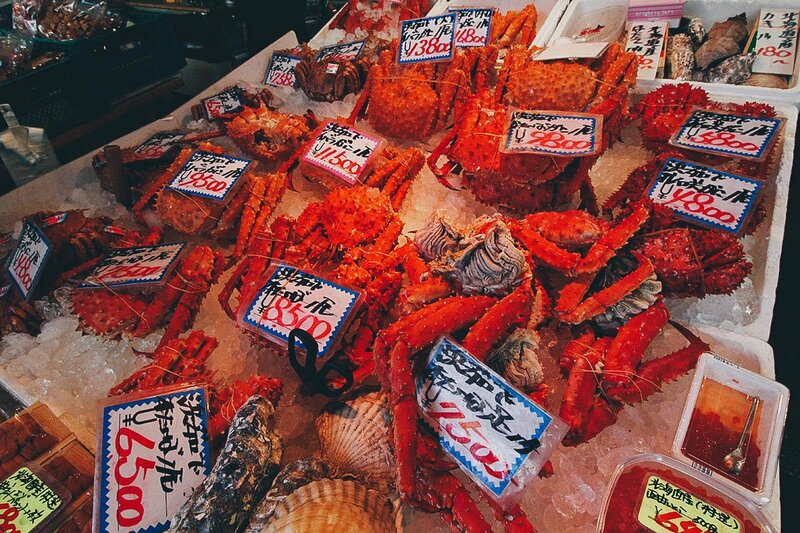 Matsuba crabs are male snow crabs fished from the Sea of Japan. 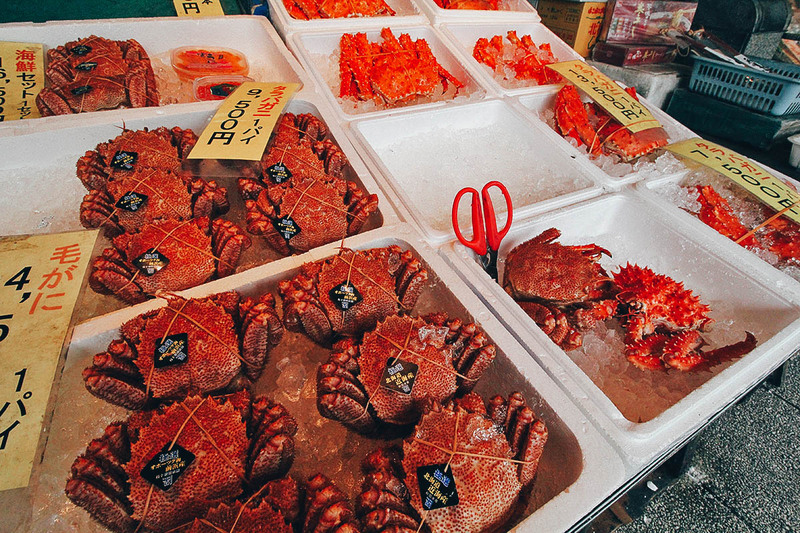 Like Hokkaido crabs, they’re considered to be some of the best crabs in Japan. Like I said, crabs are everywhere here. You can buy whatever you want and eat them at the tables around the market. 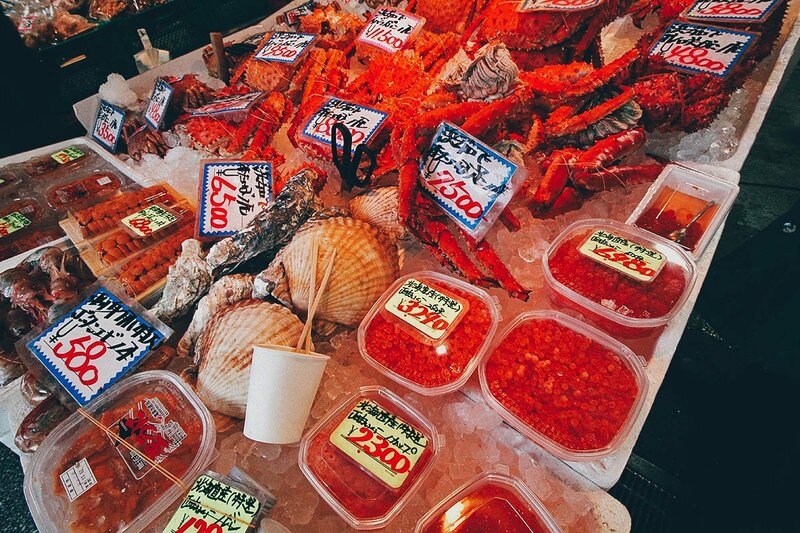 Apart from crabs, they have all kinds of fresh seafood here too like scallops, oysters, uni (sea urchin), and ikura (salmon roe). Hokkaido oysters are huge! We enjoyed many at this great sidewalk restaurant/stall called Gotsubo. 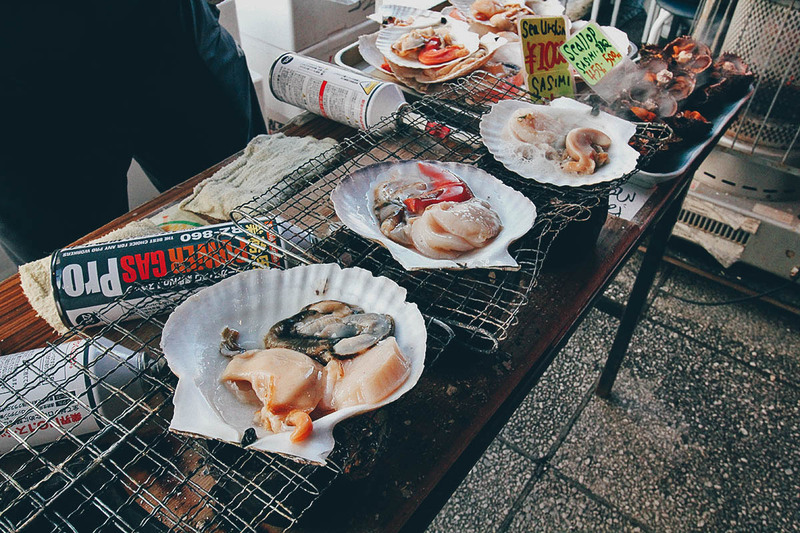 The variety of seafood products was endless. 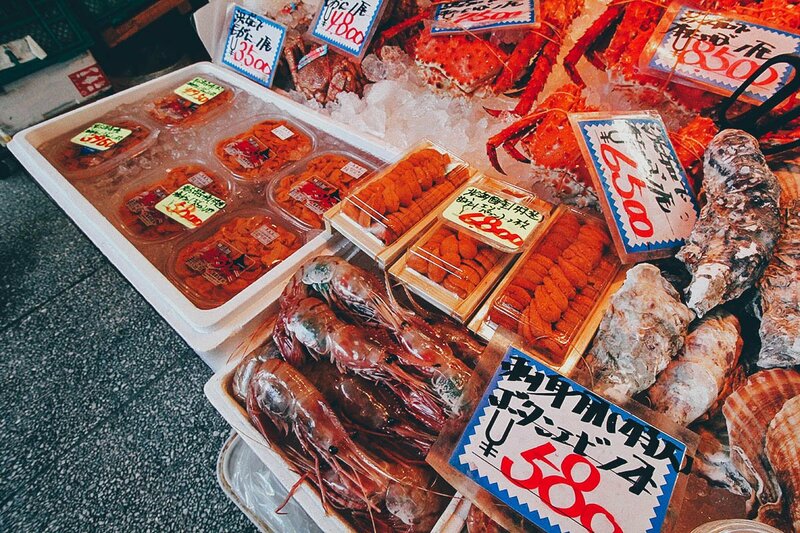 Check out the prawns and all that beautiful uni! We were on our way to the Sapporo Beer Museum for lunch so we didn’t eat a big meal here, but we did stop to have some barbecued scallops and uni. 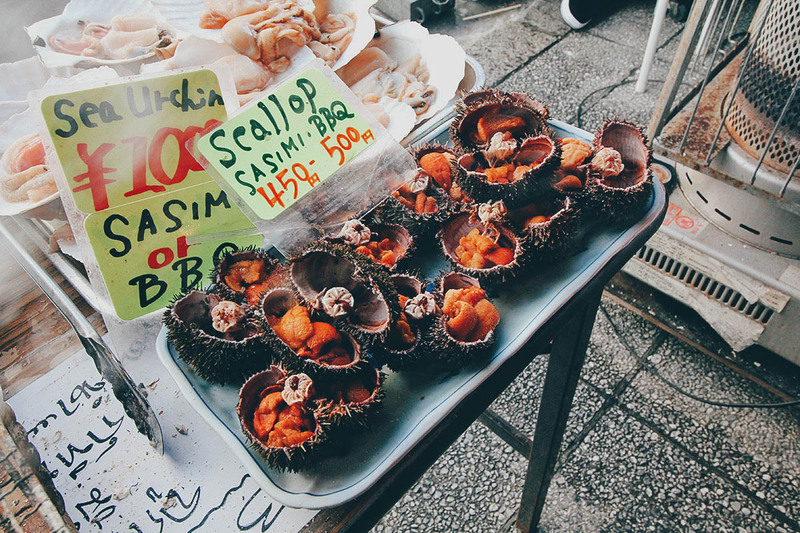 Like the scallops, you can have uni one of two ways – raw like sashimi or barbecued. We’ve never had uni barbecued before so we gave it a shot. Torching our uni. It was pretty good, charcoal-y in taste, but it kinda loses that uni sweetness which I love. I much prefer it raw. 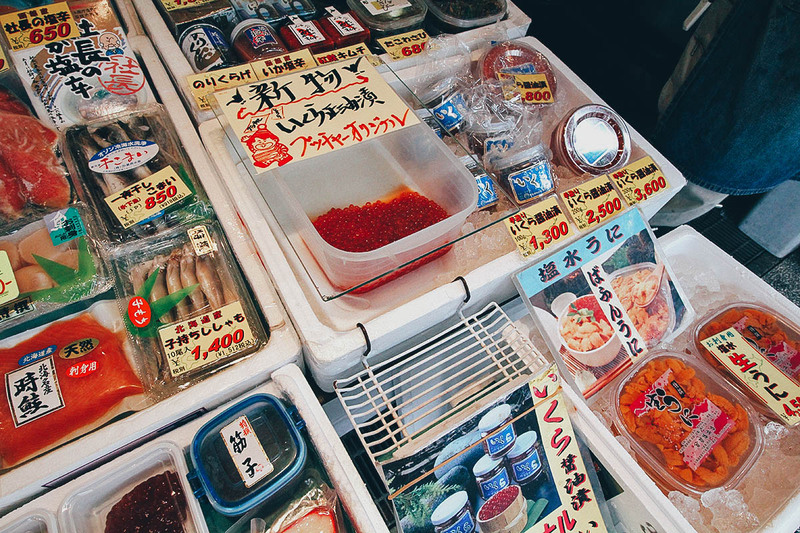 Nijo Market spans an entire block but you can get through it in less than half an hour. We probably spent no more than twenty minutes here and that was good enough. I read a few reviews on TripAdvisor calling Nijo Market touristy and pricey and I would tend to agree. Perhaps they increase the prices during peak seasons like this. 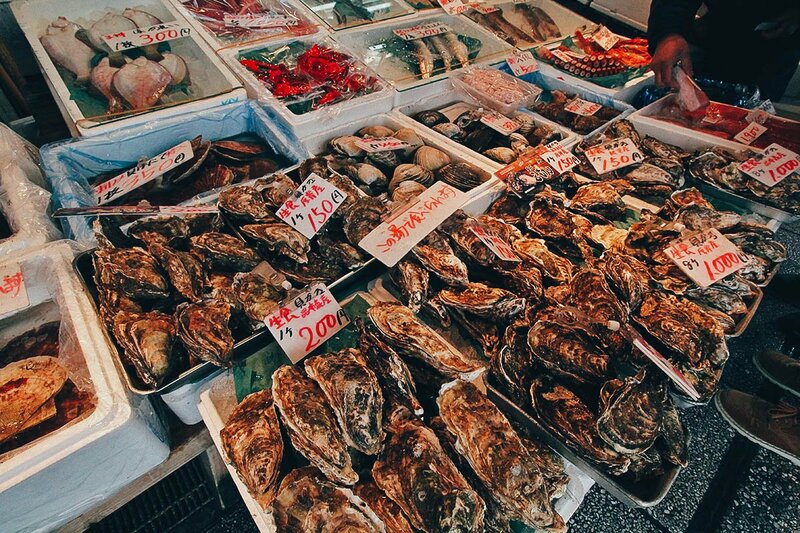 If you scroll up to the picture of the oysters, you’ll see that they’re priced at JPY 150 or 200 apiece. That’s kinda expensive. Not sure if they’re bigger here but as previously mentioned, we ate at Gotsubo and paid just JPY 105 per oyster. It actually came out to less than that because the owner would always give us a few extra pieces for free! 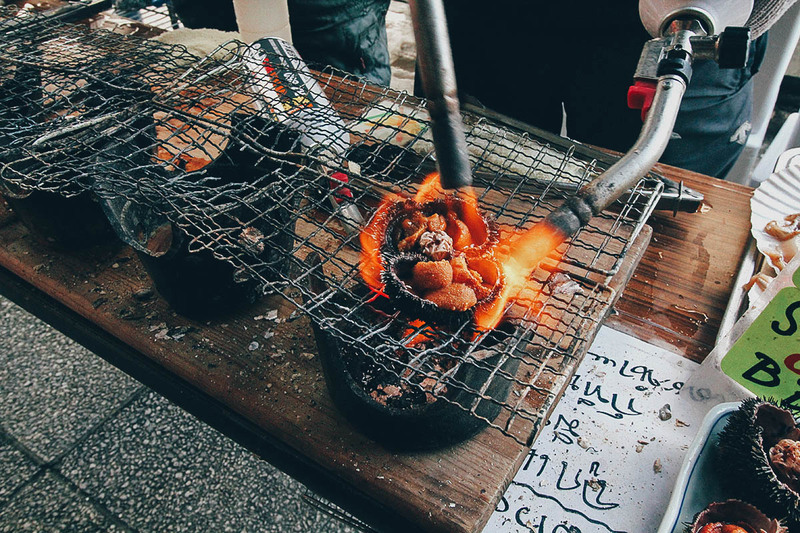 The barbecued uni and scallop seemed a little pricey as well at JPY 1,000 and 500 respectively. Shouldn’t food cost less at a market? In any case, touristy or not, it’s so close to Odori Park that it merits a quick stop. 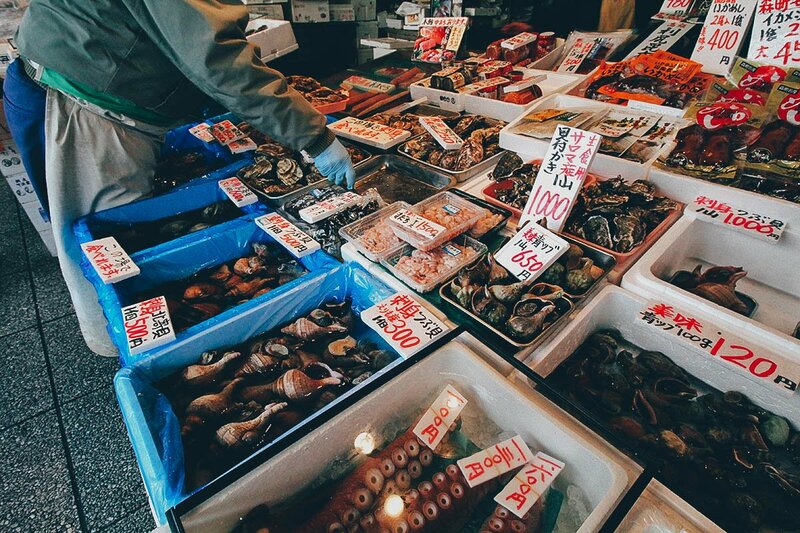 It’s a fun place to visit, especially in winter if you like food and have never been to a Japanese wet market before. The sheer volume of crab will have you oohing and aahing! If you’re on a tight budget though and wary about the prices, then you’re probably better off eating somewhere else. Nijo Market is three blocks south of Sapporo TV Tower on Odori Park. It’s about a five minute walk from Odori Station on the Nanboku, Toho and Tozai Subway Lines.